CAFOD consisted of the partner from Vietnam, Myanmar, Cambodian, Filipina. They came to Indonesia in order to attend AMCDRR event (Asian Ministry Conference – Disaster Risk Reduction) that held on October 22-25, 2012. The visit to the field was necessary as their enrichment materials so that KARINAKAS as the member of Caritas Internationalist facilitated their activities. The discussion session with Tegalmulyo village was interesting. 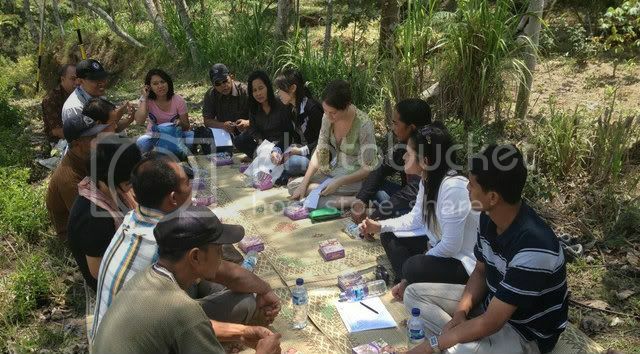 However the interpreters who were good in English, Bahasa Indonesia and also Javanese were needed considering that most of the resource person were using Javanese. This meeting was held in the field in which the view is Merapi summit. After the meeting and discussion with community, they went to the area when the heat-clouds hit and went down on the last Merapi eruption.